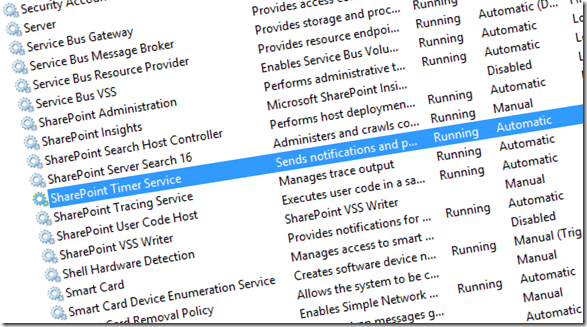 We all know that alerts get fired via the SharePoint Timer service. Once I looked into the workflow issue, I was told “they weren’t working”. Well, they did start, but they went into a pause and never woke up. They were stuck In Progress in a paused state. What is responsible for waking up a workflow out of a pause? Yep, the SharePoint timer service. You check the service, and voila, its stopped. You try to start, get an error stating login failure. What the!? You go to the service properties and re-type the same password for the farm account. You might even go to Central Admin and generate new farm service credentials. This corrects the issue for about 24 hours, then the next day, you get the same cries from the users. What’s going on? What happened was that IT had removed or restricted the ability to define which accounts can “logon as a service”. I alerted IT to this fact, requesting they add the farm account back please. Once they did this, bada boom bada bing, the timer service stayed running. Just reach out to us if you need any assistance with SharePoint’s many services or infrastructure!